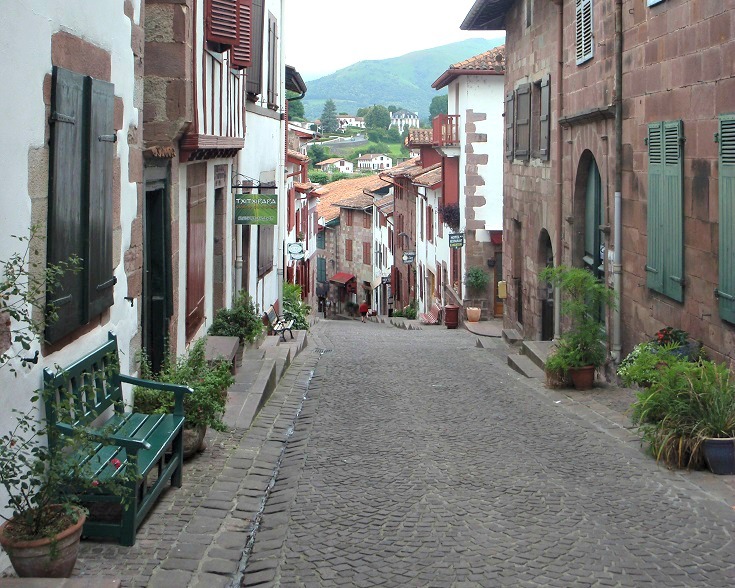 A recent addition to the ranks of France’s most beautiful villages, Saint-Jean-Pied-de-Port is a delightful note on which to end a long-distance walk along the Chemin de Saint-Jacques du-Puy. I’ve enjoyed many unforgettable moments here. Before you scroll to the bottom for practical tips on where to stay and where to eat, these are a few of my favourites! It goes without saying that the end of any long-distance walk invokes a mixed range of emotional responses – gratitude and relief that you’ve made it safely; that tomorrow’s weather doesn’t matter so much; that tomorrow’s schedule may allow a luxurious sleep-in and blisters and stiff muscles can finally start to recover. But all endings carry an element of sadness – that the new friends you’ve made over the past weeks will be going their own ways; that tomorrow may actually need some sort of plan and activities more complicated than putting one foot in front of the other and remembering to keep your water bottle topped up. 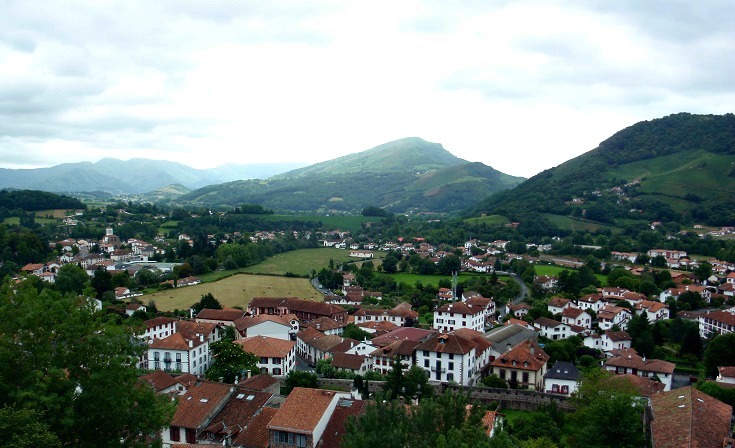 Whether you’ve come 750 kilometres (470 miles) from le-Puy-en-Velay, broken the journey into shorter stages or you’re continuing on across northern Spain to Santiago, take a moment to celebrate – and raise a glass to acknowledge your achievement! 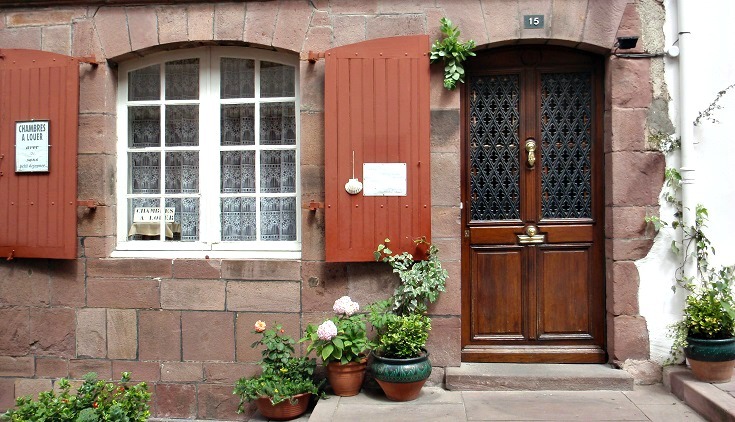 Next door to Prison des Évêques, at number 39 Rue de la Citadelle, is Bureau des Pèlerins. Here you’ll find answers to all your questions regarding the 800-kilometre (500-mile) walk across Spain to Santiago. If you think you may return one day to make this journey yourself, call in, ask questions and pick up your crédencial, or pilgrim’s passport, which allows access to the refugios along the Camino. 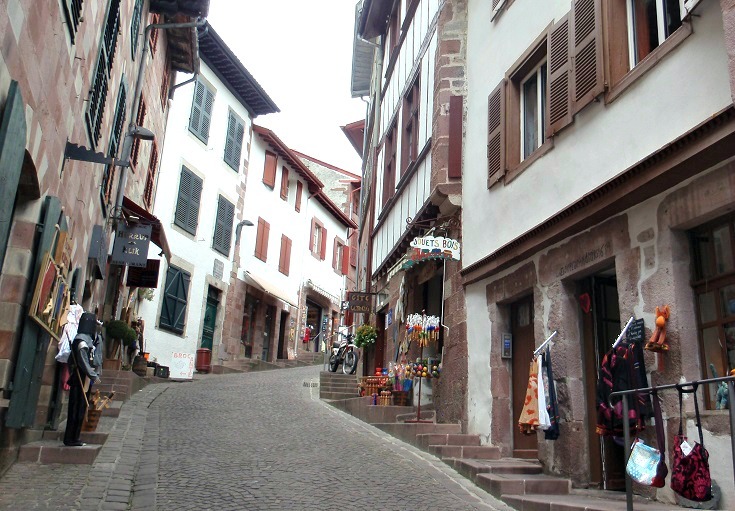 Continue along Rue de la Citadelle to the bottom of the hill. 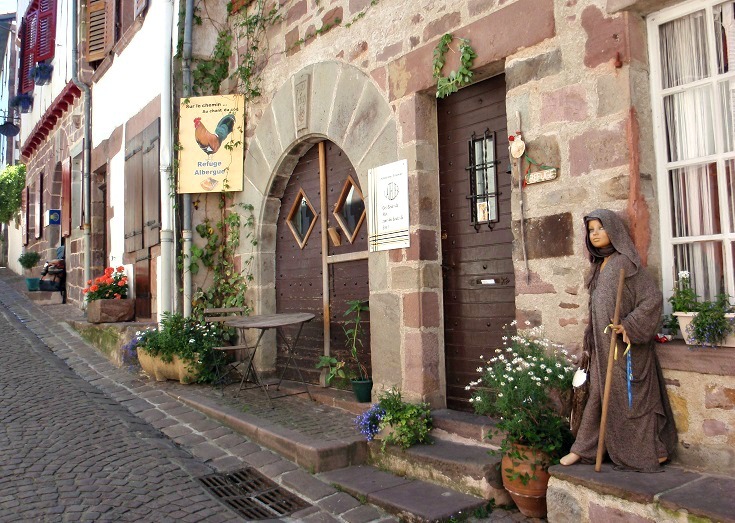 On your left, hemmed in snugly among shops and the city walls is Église Notre-Dame-du-Bout-du-Pont. 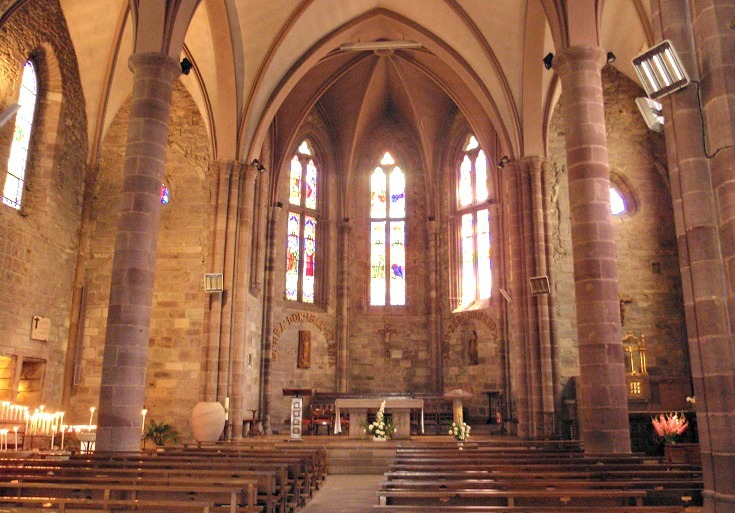 Pilgrims’ Mass, held here each evening, is a memorable experience for many walkers and the front corner is often ablaze with dozens of candles, lit as an expression of thanks for a successful journey from le-Puy-en-Velay or as a requested blessing for a safe journey to come. 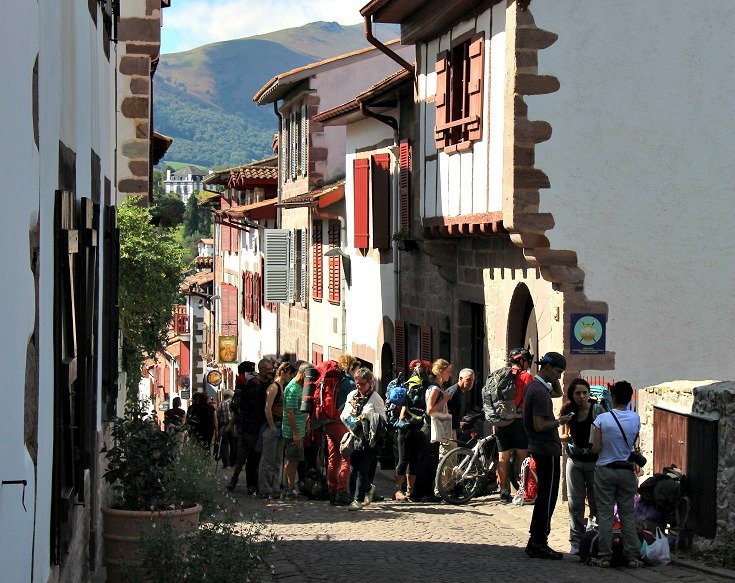 The pilgrimage to Santiago begins at the bottom of Rue de la Citadelle where Porte Notre-Dame leads walkers across the oft-photographed Pont Romain (Pilgrims’ Bridge) and on to Rue d’Espagne. 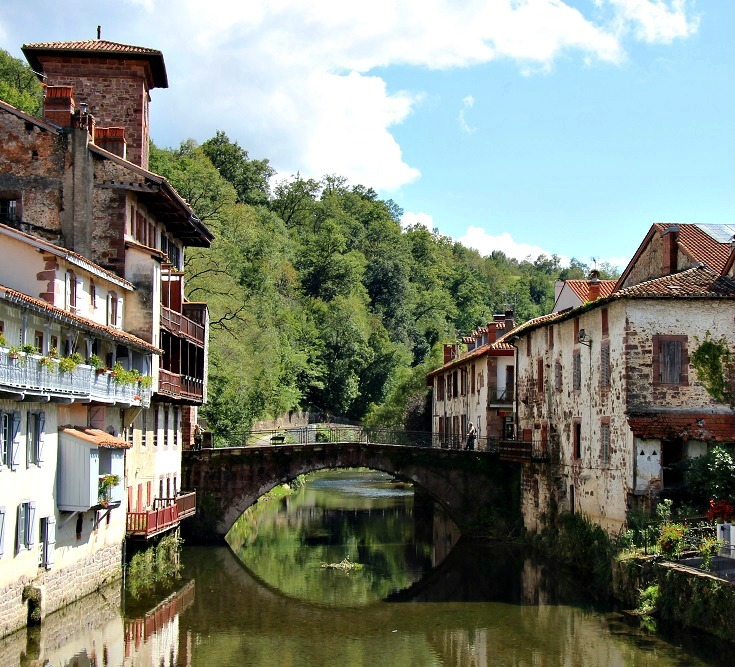 Instead of crossing the bridge, turn right and follow Rue de l’Église to the main road where you’ll enjoy views back along the river and, no doubt, capture your own ‘magic moment’. 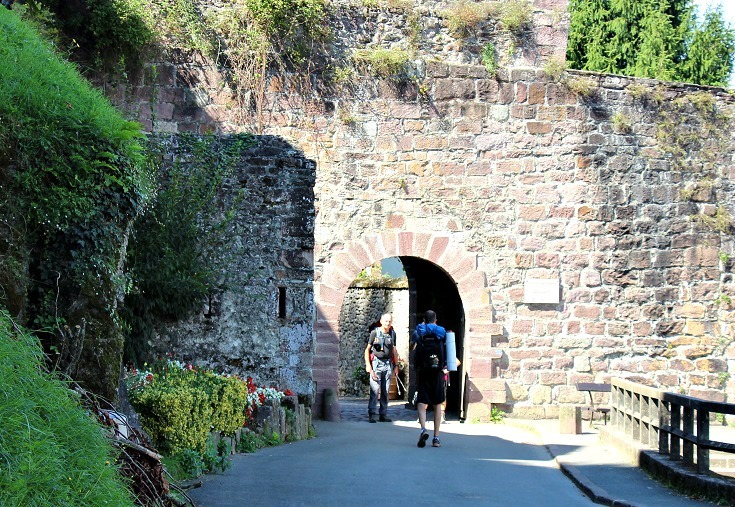 A walk along Chemin de Ronde, the medieval wall, will take you from Porte de Navarre near the river back up the hill to Porte Saint-Jacques, offering picturesque views towards the Pyrénées Mountains. The crisp white stucco walls of the houses, with their contrasting deep red or green shutters and red roofs, scattered among lush green hills provide a postcard view – and possibly rekindle that urge to keep walking and discover what lays beyond those mountain peaks! 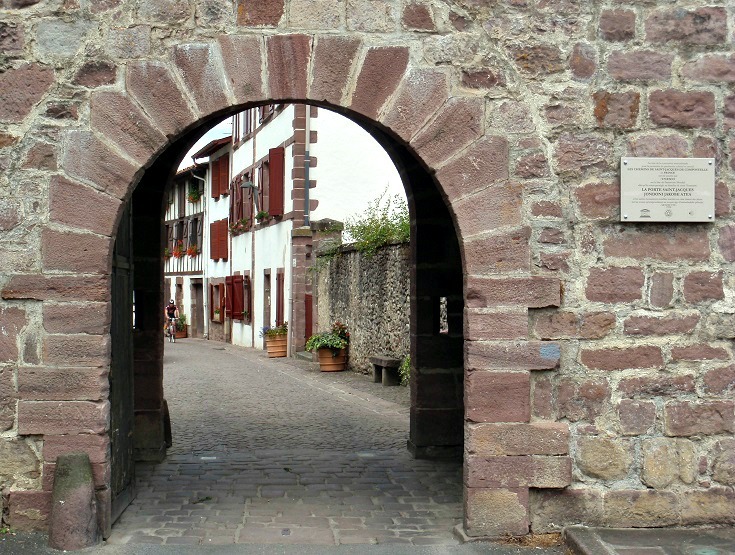 It was from Chemin de Ronde that soldiers guarded Saint-Jean-Pied-de-Port in medieval times, providing the first line of defence against attacks from the Spanish. Behind them, the Citadelle, which towers over the town from Mendiguren Hill, provided protection for the ruling nobility. 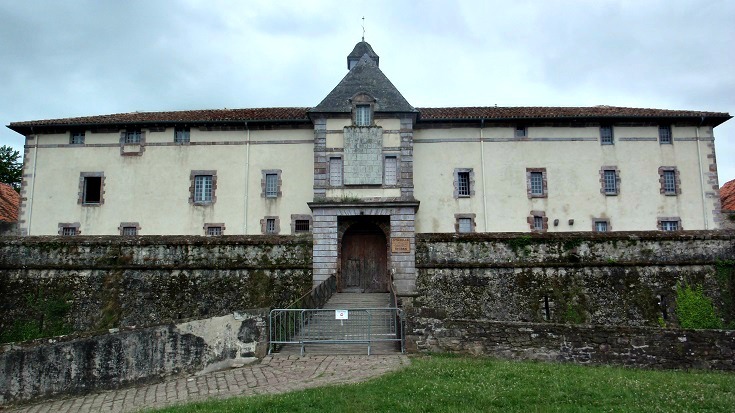 Built in the first part of the seventeenth century on the site of an earlier fortified château, the buildings now host the secondary school. The grounds can be explored at any time or guided tours of the Citadelle (en français) leave from the Tourist Office—on Thursday afternoons in July and August and on Monday afternoons in September and during school holidays. And if you can’t walk another step? Le Petit Train Touristique will whisk you around all the major sights in 40 minutes! 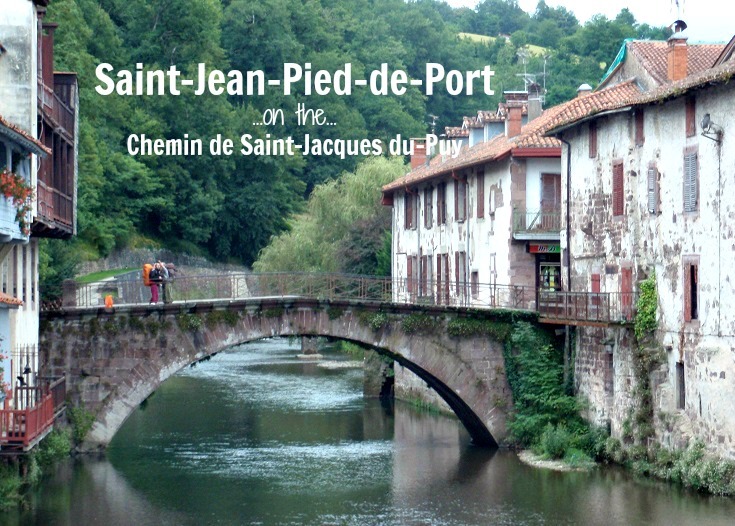 Saint-Jean-Pied-de-Port is located 750 kilometres (470 miles) along the Chemin de Saint-Jacques – thirty-nine day’s walk from the starting point of Le-Puy-en-Velay. 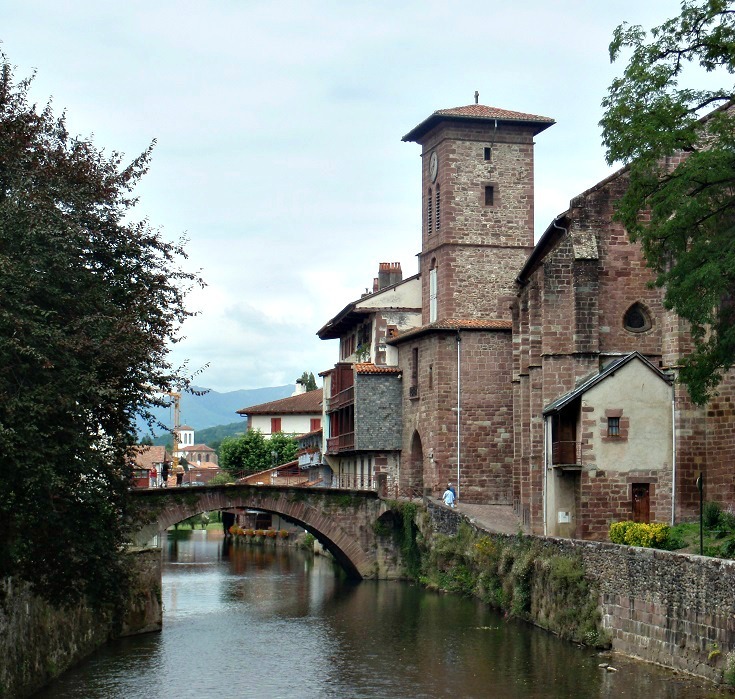 Frequent bus and train services connect Saint-Jean-Pied-de-Port to Bayonne and on to Bordeaux and Paris providing several options for exploring the region more widely – or heading home once your walk is over. You’ll find the Tourist Office on the main road at 14 Place Charles de Gaulle. Opening hours are listed here. Before you arrive, download a map (available in French, English and Spanish) with several places of interest marked. 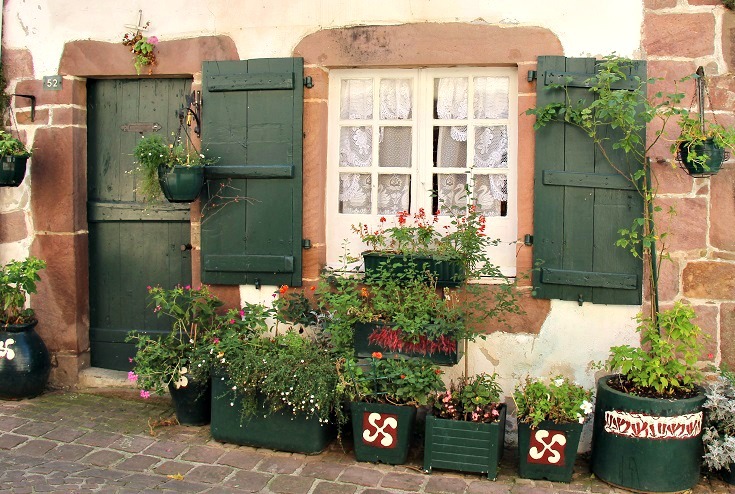 There is no shortage of accommodation in Saint-Jean-Pied-de-Port, with something for every taste and budget. If you’ve spent most nights over the last few weeks sharing a dorm room with snoring strangers and feel you’ve earned a night of comfort (and privacy! ), I can thoroughly recommend Hôtel Itzalpea and Maison d’hôtes Ziberoa (both are very reasonably priced). Whether you’re hankering for crêpes or a simple pizza or looking forward to something more upmarket or typical of the region, you’ll find something close by to suit your tastes. For a delicious, traditional meal based on local produce, I can recommend Oillarburu on Rue de l’Église (where Martin Sheen dined before setting out across Spain in the movie The Way). You’ll find a comprehensive list of restaurants here. There is also a full range of bakeries, supermarkets and speciality food stores in town which cater well to the throngs of walkers. Fresh food markets are held at Marché Couvert every Monday morning (Tuesday if the Monday is a public holiday). Place Charles de Gaulle hosts a general market all day each Monday.